One of the more interesting watches for me from Baselworld 2017 was the limited edition Seiko SLA017 and the associated non-limited edition SPB051/053. As the rush to grab one of the 2000 SLA017s has begun to die down (it looks as though there are still a few new ones left out there), my interest in the SPB053 began to increase. 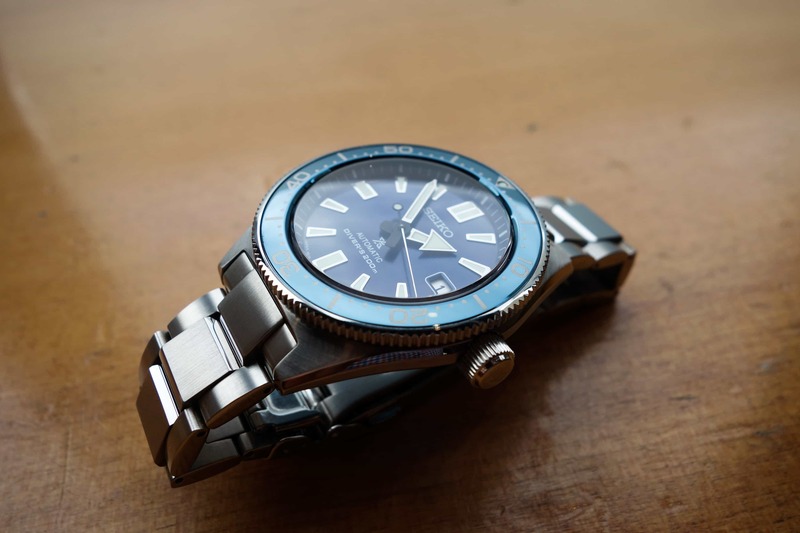 Perhaps my previous experiences with sub-$1,000 Seiko divers (the Sumo and SKX007) had something to do with my decision to hunt down a SPB053. The value presented by the Seiko Sumo variants sometimes makes me wonder why I spend more. That said, the size of the Sumo is not for everyone’s wrist. The SPB053 paired with one of our American-made ADPT straps. Back to the SPB053. While its case and dial share some of the SLA017’s looks, it is its own watch. A modern interpretation of the original Seiko “62MAS,” this latest addition to the Seiko Prospex line is a midsize diver with a water resistance rating of 200 meters. Sporting a sapphire crystal and the scratch-preventing Dia-Shield coating, this looks to be another good value offering from Seiko. At this time, the black dialed SPB051 (with a bracelet) has a MSRP of $1,100 and the blue dialed SPB053 (with a silicone strap) has a MSRP of $800. This midsize diver comes in a 42.5mm diameter case with a lug-to-lug dimension of 50mm. Its thickness is just a bit under 14mm, and the drilled lugs are 20mm wide. The case is protected with Dia-Shield, Seiko’s proprietary coating which is designed to repel minor scratches and abrasions. With the specifications out of the way, on to my first observation—this is a very attractive case! The tops of the lugs are brushed with a circular finish and the sides of the case have a band of brushing flanked by two polished surfaces. Per Seiko, this is a Zaratsu polished line, which creates sharply defined edges and seamless mirror finishing. I have seen the term before used to describe the finishing on Grand Seikos, and while this is certainly not a Grand Seiko, the finishing is expertly done. The top polished surface begins at the edge of the circular-brushed lugs and runs the full length of the watch. The bottom polished surface slopes towards the case back to create a comfortable fit that does not irritate my wrist bone. The screw down crown at three o’clock is sterile. The bezel has a coin-edge grip with a slightly sloped blue insert. The stainless steel bezel insert is polished and reflective, which in turn produces some interesting light play. Indoors, it usually appears dark blue or almost black. Outdoors, the reflections of the sky will produce a lighter blue color. The insert has full minute marks for the entire circumference and a luminous pip at 12 o’clock. The coined edge produces good grip without being sharp. Luckily, my example came without the dreaded bezel misalignment issue which seems to be randomly affecting some Seiko divers. The bezel action is smooth and has little play. While I have not disassembled the bezel to inspect the construction, it feels as though there is additional friction beyond what a normal internal spring provides. It is possible that a mechanism similar to the old friction bezels is in place. Regardless, I enjoy the bezel action and it is similar to a Seiko SLA017 that I recently handled. As a welcome update, the crystal is a slightly domed sapphire with an internal anti-reflective coating. This is as opposed to the usual Hardlex crystals found on almost all other Seiko dive watches at or near this price point. The profile of the crystal is sloped to meet the upward sloping bezel insert. A slight gap between the crystal and bezel is formed by a turn down of the inner lip of the bezel. I am not sure if the gap serves a purpose, but this detail is found on other Seiko divers and it does help break up the otherwise smooth and domed top side of the watch. Unfortunately, this gap does seem to catch small pieces of lint from time to time. The SPB053 dial is a deep blue color with sunburst finishing. The sunburst finish yields the usual effects of producing a dynamic color and appearance that is varied by ambient lighting. The dial has applied polished indices at all of the hour marks, except at three o’clock, which is filled with a white date wheel. The date wheel opening has a white border, making for a more finished appearance. The shape of the indices varies by location on the dial, with rectangular shapes at six, nine, and 12 (there’s a double marker here) and a trapezoidal shape at the remaining locations. The writing on the dial is the standard configuration for Seiko divers, with “SEIKO” on the top half of the dial and the Prospex “X” symbol followed by “Automatic Diver’s 200m” on the bottom half. Sharing the handset with the updated Seiko Tunas, the hour hand is a broad arrow and the minute hand is a long sword. This handset seems to be one of the main departures from the original 62MAS, which this model is based on. While I was not particularly fond of these hands at first, I came to realize that the shapes are very legible and they have grown on me over the last few weeks of ownership. The hands have a matte, silvery finish with black bases. Having a polished finish on the hands would have been an improvement and it would have matched the indices. Both the hands and dial indices are filled with Seiko’s updated LumiBrite paint, which has a long-lasting and intense green glow in the dark, but has an off-white/slightly creamy color during the day. Inside the watch is the 6R15 automatic movement ticking away at 21,600 bph. This 23-jewel movement hacks and can be manually wound. With a Spron 510 mainspring, the 6R15 boasts a 50-hour power reserve. This is now a a proven Seiko timekeeper. The SPB053 came mounted on an accordion-style silicone strap. This strap has a Seiko signed stainless steel keeper and buckle. The strap is slightly stretchy thanks to the material and the vented shape near the lugs. The underside of the strap has a raised texture to provide grip and additional ventilation during warmer weather. Unfortunately, this material does seem to attract and pick up lint from clothing. I procured a SPB051 bracelet separately from this watch, as the SPB053 is currently only available on the silicone strap. This was a personal aesthetic choice on my part, but hopefully Seiko takes notice and makes this bracelet available as an option as they have done with SKX007/009 models. This solid-link bracelet is visually similar to an oyster bracelet, but it has slight detailing differences to make it even more appealing. Overall, the bracelet has a brushed finish on the top and inside surfaces, while the edges are polished. Also polished are the inside curved edges of the center links. These center links are slightly raised to help create a more dimensional look. The bracelet begins with a width of 20mm at the lugs and tapers to an 18mm width at the clasp. Seiko has improved upon their standard stamped clasp and have provided a solid, stainless steel folding clasp in its place here. A diver’s extension is on-hand here via a compact link above the clasp, which folds out to provide additional length for wearing the watch over a diving suit. This diver’s extension is part of the clasp, but it does pivot to provide a comfortable fit. Like the case, this bracelet is also coated with Seiko’s Dia-Shield coating. My only complaint with the bracelet is that the solid end links do not better conform to the shape of the case. The construction of the end links also slightly increases the watch’s lug to lug dimension, as the lug reaches out to the bracelet via a solid connection (rather than by a separate bracelet link that goes into the end link and pivots). While this is not necessarily a bad thing, it is just something to be aware of if this watch is already towards the upper size of what would be comfortable on your wrist. Overall, I am very pleased with this modern interpretation of the iconic 62MAS. During the review period, I have worn the SPB053 on the bracelet for nearly a week straight. It has been comfortable on the wrist during this time, albeit slightly heavy at 174g (it is 124g on the silicone strap). The fit of the case seems to sink slightly into my flatter 7.25-inch wrist, yielding a thinner profile than what the dimensions would suggest. While it is nearly the same diameter of a Seiko SKX007, this watch does have a slightly longer lug-to-lug, and it wears like a medium/large dive watch. Shown here on a TOXIC strap. It seems that I am searching for reasons to use and turn the bezel to time activities, as the bezel action is an enjoyable combination of friction and clicking sounds. The polished bezel and Dia-Shield coating do seem to pick up more than their fair share of smudges and fingerprints, but so far the coating has prevented any actual scratches from occurring during my short time of ownership. I would highly recommend adding a bracelet to complete the SPB053 package. Otherwise, the SPB051 (black dial) does include the bracelet and will look great on a variety of straps. Only one question remains: what nickname will this Seiko watch end up with? For more information, visit Seiko. Words and photography by James Smith.